As regular readers of our blog will already know, the subject of biomimetics – biologically inspired engineering – is a topic we find truly fascinating. After all, for millions of years the natural world has been providing solutions to problems we haven’t even thought of yet! In the past we have brought you a number of exciting stories about how nature is helping to inspire the robots of the future. But it’s not only the field of robotics that is benefiting from the wisdom of Mother Nature. In fact, nature is helping to inspire a number of other innovations too, including state of the art materials that could one day help us to swim, or even fly faster! Researchers are making great strides towards developing artificial skin with some truly remarkable abilities. Their source of inspiration? Sharks! What’s So Special About Shark Skin? 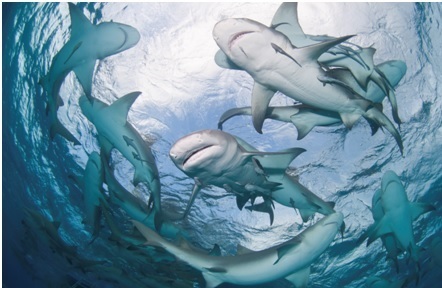 Sharks are the ultimate predators. And, as it turns out, asides from their teeth, their fierceness has a lot to do with their rather remarkable skin too. In recent years, scientists have discovered that rather than being smooth, as they originally though, the surface of a shark’s skin is actually rather rough. Unlike other fish species, sharks don’t have scales. Instead, their skin is covered in a series of tiny interlocking teeth. These are known as denticles and render shark skin rough, like sandpaper.These terrific teeth-like structures have a major role to play in the splendid swimming abilities of sharks and make them faster and more manoeuvrable. If you’re wondering how, it’s because these denticles act to disrupt the flow of water over the sharks body, reducing drag, and thereby allowing these animals to move with greater speed and stealth. In the last few years engineers have made numerous attempts to reproduce the roughness of shark skin when designing everything from swim suits to cars. But now, engineers are using 3D printing techniques to develop some of the most advanced artificial shark skin materials yet! A team of scientists from Harvard University recently used a micro-CT scanner to investigate the skin of a Mako shark – obtained from a local fish market. And what they found was rather extraordinary. From this scan they were able to create a precise 3D model of the surface of the sharks skin. This was then produced using a 3D printer and a plastic polymer material, covered in denticle like structures. The end product was a material with an undeniable likeness to the sandpapery feel of shark skin. Under laboratory test conditions, this artificial skin was found to both increase speed and reduce energy expenditure in comparison with a smooth plastic paddle that was not equipped with denticles. Whilst this new material isn’t quite ready to take the engineering world by storm just yet, in the future this technology could be utilised for a board array of exciting applications, including in the development of even better swimwear. The team behind the project also believe that synthetic shark skin could also be used in aircraft designs to make aeroplane wings more energy efficient, by reducing drag – pretty neat right?! So there we have it, another fantastic example of biomimicry in action. Here at European Springs we love story’s such as this and can’t wait to see what the future may hold for this amazing technology. As leading spring manufacturers, we like to think that our spring products, such as our tension springs, are an amazing feat of design and engineering too. Innovation is at the heart of what we do and we supply as wide range of pioneering spring products to a broad range of industries, from the aerospace sector, to the medical field. Want to know more about our high quality spring products? Then contact us today, by giving us a call on +44 (0) 208 663 1800 to speak to a member of our friendly team.